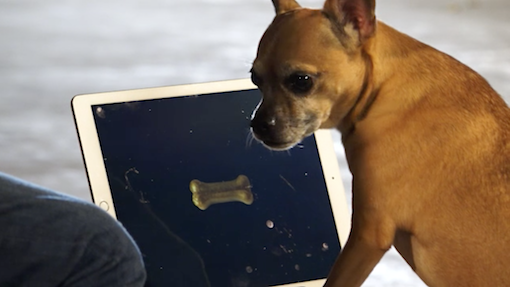 How does a dog react when his favorite treat magically disappears and then reappears inside an iPad? That is exactly what I wanted to find out in my new iPad Magic Clip. On a cold January day I gather my team in a picturesque barn in Anzing near Munich. A great setting, that has been provided for our shooting by our host Bernhard Hollerith. Our goal was to create the legitimate successor to my video “Chimpanzees React To iPad Magic“ that has just recently reached 10 million views on YouTube. 15 dog owners in total took the time on a Sunday and dropped by in 30-minute intervals with their four-legged friends. Simply marvelous to watch each dog’s own character and his or her unique reaction to my performance. From openly displayed indifference to enthusiastic curiosity and playfulness. But they all agreed on one thing: the appearing giant bone in the end was worth the wait. It has never been so hard to cut a video into a YouTube-appropriate length. We would have loved to show each and every one of our new animal friends. So please take 2 minutes of your time! The stage is yours: Emil, Paula, Flo, Bella and Polli! And for all of you who would like to watch more animal clips, here’s our adventure with the chimpanzees from Schwabenpark.